Have you ever found spots on your car where the paint has faded? If your car paint has faded in places, then you have officially experienced the phenomenon of car paint oxidation. How Did My Car Paint Oxidize? Car paint oxidation occurs when oxygen and water interact with the outermost layer of your car paint. As the paint surface interacts with the elements in the environment, the paint color gets duller over time. The ultraviolet rays from the sun can chemically break down the paint, which leads to oxidation. The lack of a protective layer could also leave your car more susceptible to scratches and even rusting. 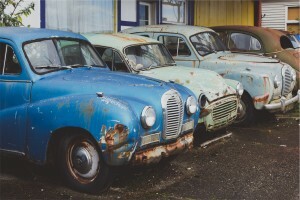 Oxidation can lead to rust on your car. Oxidation is extremely rare on more recent car models, especially due to the solvent based clear coat. A clear coat of paint on a car protects the color from the elements, including things like oxidation. As long as you have a protective layer between your color paint and the elements, you are safe from car paint oxidation. You can fix your car’s paint oxidation without removing layers of paint. If you want to take on this task, make sure it is not too hot outside and that you are protected from any precipitation. You can start by polishing your car with a polishing compound for removing oxidation. If the car paint oxidation is extreme, switch from the polishing compound to a rubbing compound for better results. Once you’ve removed the oxidation, you just need to wax your car to provide a layer of protection. You might want to consider waxing your car regularly to keep up the color quality of your car’s paint finish. You can protect your car color with a quality clear coat of paint. Repair minor scratches or dent that could have affected the paint job so you don’t end up with bigger problems. You can also wax your car to prevent oxidation. The wax adds another layer of protection to the surface of your car. Regular car washes and waxes can help you protect your car’s paint finish. Liberty Collision can provide a quality paint match for your car. At Liberty Collision, our team as the most updated technology to match the color of your car paint. Our auto body repair shop team uses paint variant swatches so that we can find the closest match to your car’s original paint color. Any new paint color will be a little off from an exact match, which is why we can blend the paint onto panels with the original paint color to trick the eye into seeing a perfect match. We have also switched to water-based color paints supplied by PPG in order to be more environmentally friendly. 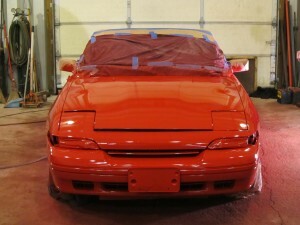 Our clear coat is still solvent based so that we can provide protection to the car’s paint job. Whether it’s a new paint job on your car, paintless dent repair, or fender bender repairs, our team can take care of your needs. Make Liberty Collision your go-to auto repair shop for car paint touch ups, cosmetic car repairs, and collision repairs today!